Strange name for a shawl, you might think. And be right. This shawl originated as an attempt to capture and transform the spirit of a Welsh landscape, complete with autumnal woods and the ruins of an ancient castle, into a shawl. The castle in question was the Castell Dolbadarn, which was built by the Welsh prince Llywelyn the Great. Hence the name. 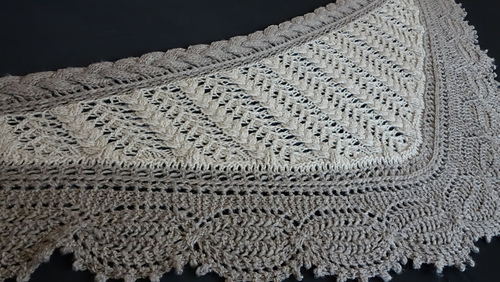 To link to the history of the land, the shawl features cables, symbolic of both trees and vikings, arrowheads and the Roman Stripe, along with an old and updated lace edge that has echoes of towers and walls. The shawl is reversible. The two sides are not completely identical, but both look nice. Charts only, with some written transition parts. Difficulty: Medium to advanced. Both RS and WS rows are charted. Provisional CO used for the first edge (18 sts). Yarn: Here shown in M&K Eco Baby Ull Solids 90 yards (82 m) / 25g ball, or 360 yards (328 m) / 100 g yarn, two colours. Colour 1 shade 175: 150 g or 6 balls; and colour 2 shade 174: 100 g or 4 balls. In all 250 g or 900 yards (820 m) for the large version. Directions for when to change colour when using two colours are given. When substituting yarn, make sure it looks attractive in both cables and lace. The yarn needs a good body to it. Originally made for a homespun 3-ply long gradient in 75% BFL, 25 % baby camel (the fiber was found at HilltopCloud) at approximately 241 yards (220 m) /100g – yarn was very unevenly spun, however, so yardage is not entirely trustworthy. The homespun shawl used 275 g fiber for the small version. 175 g used for bottom edge and center until the sideways knitted on cable edge, 100 g used for the cable edge alone. 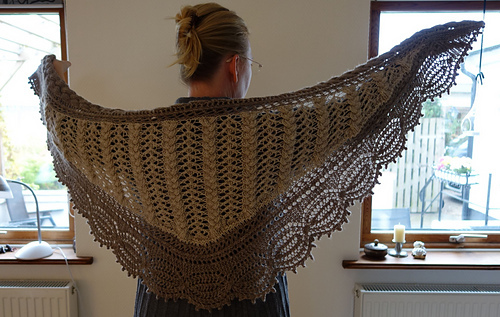 This shawl is shown on the last page for reference. Size: Two sizes are given, with in all 13 (15) edge repeats. Depending on your yarn and needles, you will have anything from a medium sized shawl to something you could wrap around you twice. Good advice on gauge: Work a couple of repeats of the edge, wash and block, that should give you an idea of how big your final piece will be in your particular yarn. 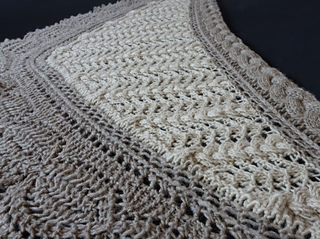 As shown with 15 repeats of the edge, the shawl measures 20 ½ inches (52 cm) deep and 65 inches (165 cm) long blocked and relaxed. 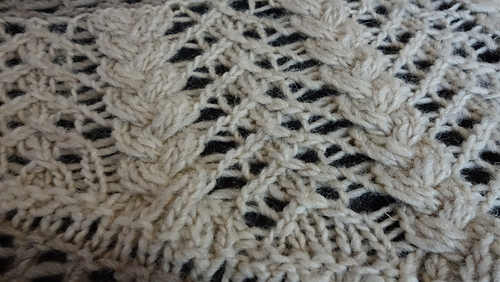 One repeat of the edge pattern measures 4 ½ inches (11.5 cm) relaxed after blocking. Homespun version measures 24 ½ inches (62 cm) deep and 70 inches (180 cm) wide. One repeat of edge pattern measures 5 inches (12.5 cm). Needles: US 7 (4.5 mm) circular needle if using M&K Eco Baby Ull. Choose the needle you need to get a fabric you like. You might want to go up a size for the bottom edge, depending on your yarn. 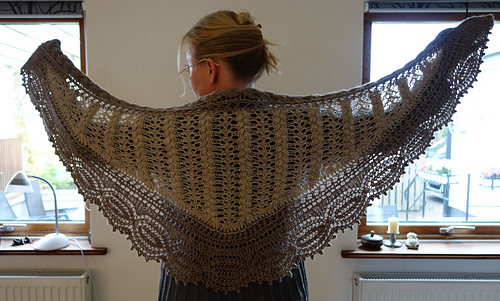 Shawl as shown was worked on size US 7 (4.5 mm) all the way through. Hopespun version was worked on needles US 9 (5.5mm) and US 10 (6mm) for the bottom edge. Cable needle. Other notions: Stitch markers. Darning needle. 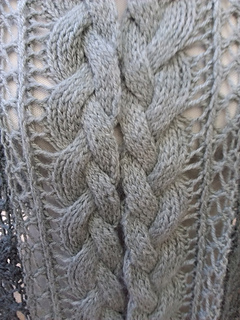 Waste yarn for provisional CO.
Construction: First a long strip of lace edge is worked, then stitches are picked up in slipped sts along the side and the shawl body is worked using short rows until a sideways knitted on edge binds off all live shawl stitches.